Hello, everyone! It's Any again and it's going to be my second year as a blog member! YOROSHIKU! This year, we are going to bring you news together with Nina, my co-worker, so it's going to be twice as much information and twice as hard looking for it.. But still, it's going to be really fun, so again, YOROSHIKU! 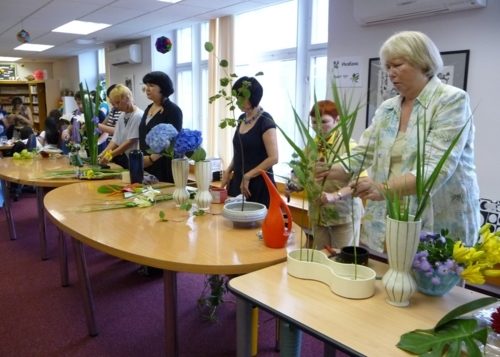 It's always a bit quiet here in Moscow office at summer for not only the number of events is much less comparing to other seasons, but also our different courses go off to summer vacation too. That's right. On the 25th of June, we held the big graduation party for all the students of our courses. 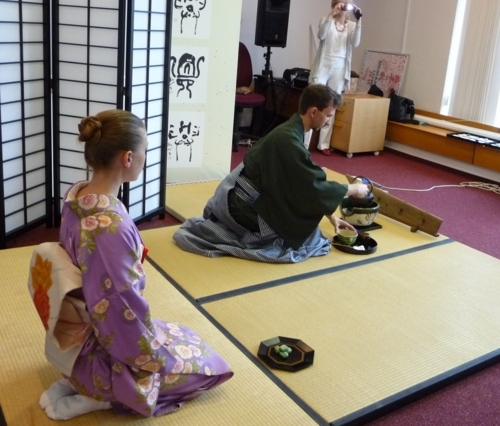 There are about 150 students attending our courses every year, learning how to make Ikebana, hold the traditional Tea ceremony and many other things. At the graduation party all the students showed their teachers and each other what they had learned during the year. And when looking at their serious faces you could tell, that not only they mastered the technical part but also the Japanese culture had become a necessary part of their life. Changing the subject I'd like to tell you that it's REALLY HOT here in Moscow. And in Moscow we don't have the magical Japanese ice-desert called "Kakigori". But we have our own Russian meal called "Okroshka". 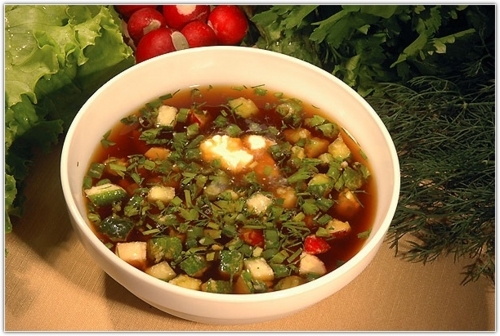 Okroshka is a cold soup, made of cut vegetables (such as radish, cucumber, green onion and boiled potate), boiked eggs and ham (or pork), served with Kvass (fermented beverage made from black or regular rye bread. thank you, Wikipedia!) and sourcream. The Russians just LOVE it, especially when it's hot. Oh, it's almost lunch time, so I'm gone to eat my okroshka at the office kitchen, passing the torch to the next blogger - Jaa-san from Bangkok!